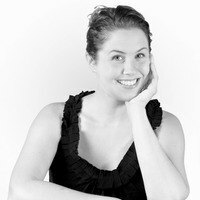 Cori Brooke has always loved writing and is passionate about children’s picture books and their ability to drive and encourage the imagination and creativity of both children and adults. Cori has been writing children’s picture books for a very long time and she loves that she never knows where her inspiration will come from. 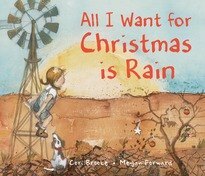 All I Want for Christmas is Rain is Cori’s third picture book. Published in 2016, it was been shortlisted for the Children’s Book Council of Australia Children’s Book of the Year in the Early Childhood category. Fearless with Dad is Cori’s second picture book, her first being Max and George (published with Penguin). All I Want for Christmas is Rain was written as a response to the terrible drought affecting so many farmers across Australia. Cori hopes that it will bring some joy and light to farmers (and maybe even rain! ), especially at Christmas time. 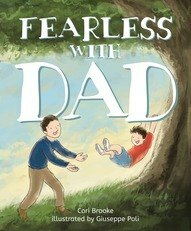 Fearless with Dad is a book that is very close to Cori’s heart as it was inspired by and written for her son and husband. Cori has a double degree in Law and Creative Industries (Media and Communication) from the Queensland University of Technology – her two degrees reflect her personality. She has a very analytical side and a very creative side. She also has a Postgraduate Diploma in Legal Practice (also from QUT) and was admitted as a lawyer in 2009. Her day job isn’t writing books, but it does involve a lot of writing! Originally from Vancouver Canada, Cori married an Australian and they now live in Brisbane’s beautiful bayside suburb of Sandgate with their young son, ginger cat and scruffy dog. Cori likes to get to the beach whenever she can, enjoys morning jogs and loves to cook and dance in the kitchen.